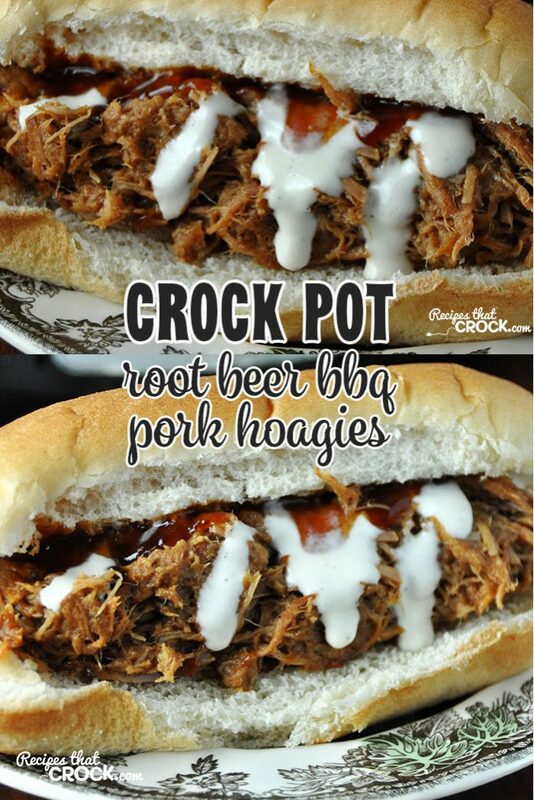 Crock Pot Root Beer BBQ Pork Hoagies - Recipes That Crock! If you love a good pulled pork sandwich, then you don’t want to miss these Crock Pot Root Beer BBQ Pork Hoagies from Gooseberry Patch’s Slow-Cooker Fall Favorites! This recipe is so easy to make! And an added bonus is that it cooks for 8-9 hours, so you can throw it on before you go to work and have it ready for you to shred and throw on some hoagie buns when you get home! Double score! This recipe makes a TON of servings, so you can buy a smaller pork loin if you don’t need as many servings, or it would be great to make for a party! A great shortcut that I learned from Mikey on shredding meat is to use your mixer! Don’t spend forever shredding your pork loin with forks, put it in your mixer bowl (or a big mixing bowl if you don’t have a stand mixer) and turn your mixer on low. In about 10-20 seconds, you have perfectly shredded pork! Make sure you don’t do it any longer than that or it will mush up your meat. 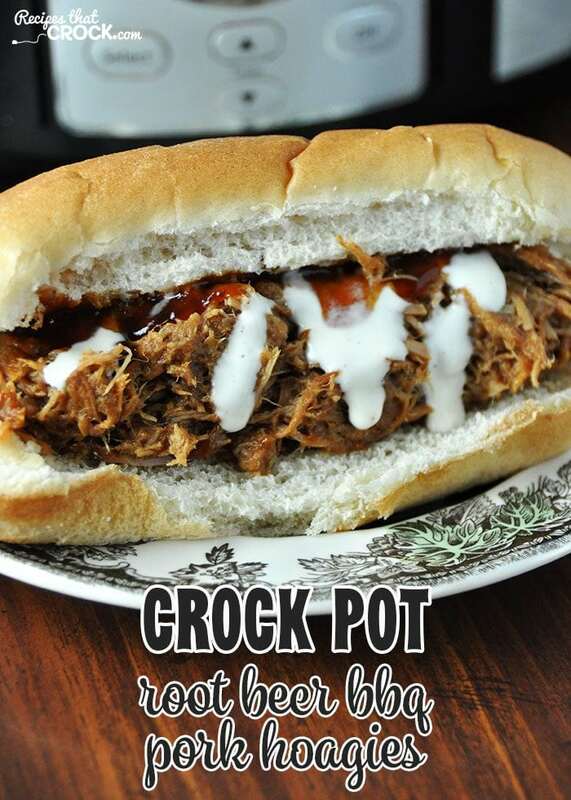 For these yummy Crock Pot Root Beer BBQ Pork Hoagies, I used my Travel Crock Pot. You can use your favorite 5-6 quart crock pot. However, if you use a smaller pork loin, you will want to adjust the size of crock pot you use accordingly. 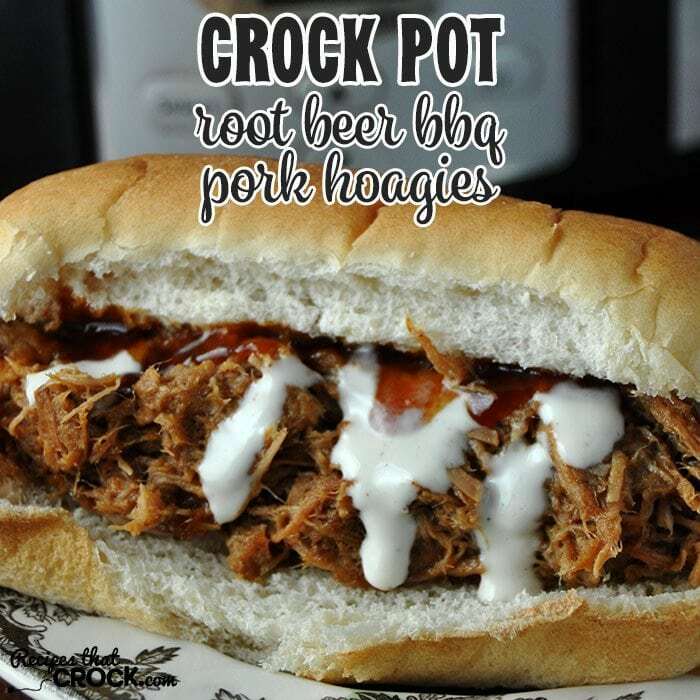 These Crock Pot Root Beer BBQ Hoagies are so easy to make and great to feed a crowd! Previous Post: « 5 Meals for $50! I get a chuckle ever time I log on; you are great. Thanks. I especially like you comment: “You don’t have to like everything we serve up, but you do have to use your manners.” I’ve extrapolated it to several situations other than food. Me too Jan! It is a good rule of thumb for life in general! Thanks so much for your kind words. They mean a lot to us! You sure you mean “pork loin” and not “pork tenderloin”? I’ve never been able to get a pork loin roast tender enough to shred easily. I actually used a pork loin. You know me, I like to be as frugal as possible! The crock pot is great making meats really tender. Enjoy! We are sharing recipes that we cook for our families but if you don’t want leftovers, you might consider looking into this cookbook for slow cooker recipes for 2: http://amzn.to/1oJ66VC Enjoy!